Portable 12V battery case for use in auto showrooms and trade shows, 6 inches thick roller case, operates automobile electronics, prevents a display car's battery from dying. 6 inch thick, under-car 12 volt portable battery station, 88 amp hours for auto showrooms and trade shows. Lithium Iron Phosphate for safety, low weight, and long life. These power supplies are also useful for powering electrical accessories when the car's engine can't be started for recharging. Just opening the door of a modern car turns on lots of lights and gadgets. Getting, in adjusting the seats, and trying out the audio, video or navigation systems helps create interest in the car. But it also runs down the battery. In a surprsingly short time the battery could be flat and sulfating. And often the local fire marshal won't allow the car's battery to be connected indoors, so the car can't act alive. A safe, portable, powerful external battery solves all these problems. 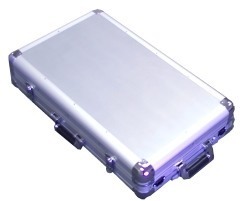 The innovative PST-ASR-88 is a roll-around case with collapsible handle and two suitcase handles for easy installation. It is only 6 inches thick, which means it can roll under just about any car or truck. The battery consists of laser welded cells that cannot emit flammable gas, so is fire-marshal friendly for use in trade shows, fairs and expositions, and any indoor venue. The battery charger is internal, so all it needs to charge is to plug into AC. So it can be charged in-place, in the office, or the shop. The standard 88 amp-hour configuration weighs 26 lbs. There is room for more batteries inside, for a total of 132 amp-hours and 40 lbs. A 25 amp circuit breaker will pop if someone inadvertently tries to start the car with the pack attached. The breaker is resettable from the front of the case. Larger circuit breakers are available on request. The PST-ASR series can be used instead of the car's battery, or in parallel with it. If used in parallel the PST-ASR will discharge about half way before the voltage drops low enough to allow the car's battery to start to discharge. After that the two batteries will discharge together. In fact, if the car's battery is low, the PST-ASR can charge it and keep it from sulfating. Top of the case showing the output connecter (left), the circuit breaker button next to it, and the AC port for charging (right). Partial charges Nightly partial charges are acceptable and will not cause any loss of battery life.